This is a beachfront haven of cool white facades that dazzle in the sun, a place where warm hospitality is a given, and where a few well-placed hammocks entice you to laze away the afternoon in the spice-scented breezes. Is it possible you've stumbled onto the private Caribbean estate of some gracious, long-lost relative? Because that's precisely what it feels like here, as the family members of Grenadian-born Sir Royston Hopkin play perfect host to fortunate guests of this lovely and languid beachfront resort. Spice Island is a dream realized, a place where Sir Hopkin envisioned time slowing down and worries melting away in an atmosphere of easy conviviality and unpretentious luxury. In that spirit of pleasant hospitality, resort guests regularly are invited to cocktail parties at the Hopkins? own home, where they meet other family members and fellow guests from around the world. 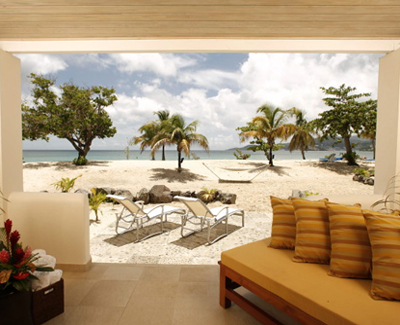 Each of Spice Island's 66 breezy suites is equally inviting and accommodating. Some are strung along a private stretch of powder-soft sand, while others are tucked into tropical gardens just steps from the ocean and have their own private pools. Clusters of exquisitely furnished one- to two-bedroom suites—with names like Saffron and Cinnamon—have wide expanses of glass that open onto Grand Anse Beach. Very private mini-villas from the Royal Collection Suites—with tasty names like Royal Nutmeg and Royal Clove—are perfect for honeymooners, each having its own cedar sauna, a spacious private pool, and a luxurious marble bathroom with whirlpool soaking tub. Of course, this being the "Isle of Spice," dining is a particularly flavorful experience. Authentic Creole specialties of fresh seafood melded with local spices are served to the background music of Granada's best live calypso, reggae, and steel bands. Even Janissa's Spa gets into the act with treatments that immerse you in the mysterious scent of nutmeg and revitalize you with the refreshing zest of orange and coconut. Sort of makes you hungry for a visit to Spice Island, doesn't it?